When my daughter Beckie was younger she decided she wanted to raise sea monkeys. Since sea monkey eggs can remain dormant for years, they are available in kits for you to raise. The packaging is attractive for children, and I’ve even seen necklaces that allow you to wear a sea monkey in a little water globe around your neck. Doesn’t that sound cute? It certainly appealed to Beckie, and the sea monkeys on the packaging looked animated and eager. Although she followed the directions on how to activate the sea monkeys eggs so they would hatch, the first attempt failed and Beckie had no sea monkeys. Undeterred, she went for it again and the second attempt resulted in several live sea monkeys. Guess what? They weren’t nearly as cute as the cartoon sea monkeys on the box. In fact, Beckie’s older sister Beth started calling them “Sea Scaries”. Sea monkeys are basically a type of shrimp. Shrimp are not that cute. Beckie, however, was proud of her sea monkey family and was determined to see them grow and reproduce to a zillion generations. Since Beckie has AD/HD, it is hard for her to remember to do tasks on a consistent basis. She wanted to check on her sea monkeys daily, and her solution was to keep them in the kitchen. She knew she would be in the kitchen every day, and would see them and have that visual reminder to check on them. This worked great for her. For my part, it was extremely unappetizing to me to see the sea monkeys skulking around their little habitat while I prepared meals. I just trained myself not to look at them after awhile. Beckie’s sea monkeys grew, and even had sea monkey babies once. Unfortunately for Beckie, she is only one of three family members with AD/HD and clutter is a big problem in every room in our house. I can’t clean as fast as they can unclean, so piles of stuff end up in the kitchen. One fateful day, Beckie’s Dad knocked the sea monkeys over and they flooded the kitchen counter. Rather than trying to scoop them back into their little habitat, Dad just dragged a trash can over and swept them all into the trash can. RIP little sea monkeys. Thinking his work there was done, Dad moved on to something else and didn’t think to mention the “terrible accident” to Beckie. When Beckie discovered the empty sea monkey container she was understandably distressed. Her strategy to keep them in the kitchen worked for her, but they were not safe from other family members who dump things in the kitchen. Her Dad’s strategy was to clean up the mess in the quickest and easiest way possible. The sea monkeys were the casualty. Beckie decided it was safer to have fish in a bowl that mounts onto her bedroom wall, and she has happily lived with her fish pets without having to worry about the bowl getting knocked over. One of the things that always puzzled me when my son Josh was younger was how he tended to be extreme in his degrees of alertness. He was very hyperactive much of the time, but when I managed to get him to sit down at the table or on the couch to do school work he became downright lethargic. He’d go from spinning around like the Looney Tune Tasmanian Devil one minute to propping his head on his hand and looking groggy the next. It’s as if he couldn’t regulate himself to anything in between the two extremes. Now Josh is a young adult, and his AD/HD sister is in her late teens and I see the same issue of regulating attention manifesting in a slightly different way. My AD/HD husband Scott, my son, and my daughter all tend to fall asleep if they are sitting still listening to a lecture. Keep in mind they are not sleep deprived, so I don’t think lack of sleep is what’s causing it. Every single week in church, they are fine during the music portion of the service. They are fully awake during the meet-and-greet time. But once the sermon begins and they are sitting still and quiet, they close their eyes and fade away. At first I thought it only happened at church, but that’s not the case. It happens any time they are required to sit quietly in one spot and just listen. I recently attended a meeting with Scott and Josh to hear a speaker discussing issues that affect adults with AD/HD. In a room with about 20 people, I looked around and saw that only Josh and Scott were in the “I’m not sleeping but my eyes are closed and I LOOK like I’m sleeping” state. So I wonder if this is something many adults with AD/HD struggle with, or if my family’s manifestation is somehow unique. When Josh has a fidget ball with him, he is better able to regulate himself and stay awake and alert. When Scott takes notes, it helps him focus. When Beckie doodles, she attends better to what is being said. Yet if none of these strategies are implemented in time, they drift away and miss many points from the presentation being offered to them. They need to plan to use the strategies prior to finding themselves in an attention-challenging situation, but planning does not come naturally for them. By the time the need for a strategy becomes clear they may already be drifting away. I know this is a very late announcement, but Clark Lawrence will be speaking at the CHADD of Columbus meeting tomorrow, January 24, 2009 at 2:00 in Gahanna, Ohio. His topic will be “Developing a Positive ADD Lifestyle”. 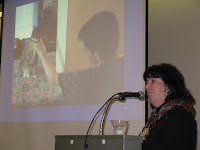 Clark is Director of the Executive Function Center in Cincinnati, Ohio. Melinda had the opportunity to interview Dr Lawrence at the 2009 CHADD conference in Cleveland, Oh. Here is the interview. If you’ve been following this blog for awhile, you know that I prefer things neat and orderly. My family, on the other hand, casually consider themselves slobs and refer to themselves as “Slobonians”. Clutter doesn’t bother them, so it is very hard to motivate them to clean up and put things away where they belong. My youngest daughter has AD/HD and the impulsivity and inattention result in clutter, misplaced items, and zippers left unzipped on backpacks. I have found some of her things in the oddest places, and she has no recollection of how they got there. This week, while at my part-time job as a speech therapist, I got a text message on my phone from Beckie. She is taking a couple of classes at a community college and was texting me to accuse our dog of taking her calculator out of her backpack because it was missing and she knew it was in her backpack the day before. While it’s true that our recently rescued dog has yet to learn what he is allowed to chew on, I thought it more likely that she left her backpack unattended and someone stole the calculator from her backpack. In any case, it was distressing since it was an expensive calculator and…it was borrowed. I was not happy with having the expense of replacing the borrowed calculator and then having to buy Beckie another one since she will have more math classes to take in the future. A few hours later, Beckie sent me another text to let me know she had found the calculator. One of the other students in her math class had found it on the sidewalk the day before and recognized it as being Beckie’s calculator and returned it to her. Yea! Beckie admitted that she had left the zipper open on the pocket she used for her calculator, so it could have fallen out without her knowing it. Whew! What a relief. That is until my husband Scott got a call from Beckie’s cell phone in the afternoon, and it wasn’t Beckie calling him. Beckie’s cell phone had been found in the grass near the local elementary school and the person was calling to say she’d leave it at the front desk in the school office. Scott managed to reach Beckie at home, and she insisted that it was impossible for her cell phone to be found by a stranger when she was positive it was at her friend’s house. (Why would she leave it at her friend’s house instead of in her hand where I usually see it? Who knows?) Beckie reluctantly agreed to walk to the school and retrieve her phone, though she was still adamant it had to be some kind of mistake. Except that it was there, to her amazement, and she learned that it had first been found a couple blocks away from the school at a place she had not walked past that day. We are all mystified. I pointed out to Beckie that she had lost an expensive calculator and a cell phone in the same day, thereby making her “The Biggest Loser” in our family so far this week. Since this time both items were returned to her, I think she was secretly amused by the title. She was definitely angry when the calculator was missing, and if she had even known her phone was missing she would have been upset. Perhaps this will help her remember to zip up pockets and so on. Time will tell. Working with a variety of modalities also increases the likelihood of later recall of material. When we incorporate auditory, visual, tactile and kinesthetic input in subject areas where our children struggle to learn, we will also be helping them learn to pay attention for longer periods of time. With that in mind, I want to share with you one of my more successful teaching activities that kept my children engaged and made the material we were studying more memorable for them. When my son was having trouble with the concept of “borrowing” in math, I lined up my children in place value positions, gave them Cuisenaire cubes and rods, and we acted out a story. I was the sheriff from Robin Hood (one of their favorite movies at that time) and came to collect taxes from the “ones” child. When she didn’t have enough cubes to pay her taxes, I showed her how to “borrow” from her neighbor and explained that she could only borrow 10 cubes from that neighbor. We did the same thing for the “tens” child borrowing from the “hundreds” child, and enacted several scenarios for practice. I had lined them up in birth order with my youngest, Beckie, in the ones place. My middle child, Beth, was in the tens place. Josh, as the oldest, was in the hundreds spot. I recently asked my children if they remembered doing that activity, and they responded with an enthusiastic “Yes!” Josh also pointed out to me that a variation of the activity has continued over the years, because Beckie asks to borrow money from Beth, who in turn asks to borrow from Josh. He blames me for this generalization of a skill learned in those early years of our homeschooling. Before you feel too sorry for him, I want to point out that I’ve also taught him how to say “No” nicely to refuse requests. 1. Notice the button and actually read it. 2. Ask which “someone” the button represented. Once again, my family surprised me. They all noticed the button and read its message, though at different times throughout the day. When my husband, Scott, read it he sighed and hugged me. When my son, Josh, read it he grinned and hugged me and said, “I love you too, Mom.” When my daughter, Beckie, read it she beamed with pride and gave me a hug. I guess this means I’m doing something right and my family feels secure in my love for them since they all three assumed the message was about them! 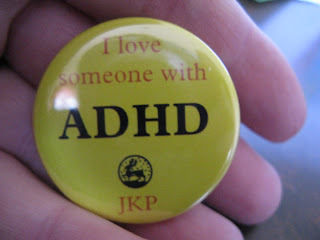 I just got back from the CHADD Conference (Children and Adults with AD/HD) yesterday and it was great to attend some sessions and connect with old friends. I did a video interview with Sarah Wright, one of the authors of the book Fidget to Focus. I also interviewed Kathy Kuhl, author of Homeschooling Your Struggling Learner and Clark Lawrence of the Executive Function Center. I enjoyed re-connecting with those folks and it was a blast to interview them considering I have absolutely no expertise with any videos other than my home videos! I suspect it is far easier to interview than to BE interviewed, but all of my “subjects” were informative and appeared relaxed. I also got a kick out of meeting Kim, who approached me the first night there to tell me she had seen the video I did with my daughter about the Sock Boxes for ADD-Friendly sock organization. A few others recognized me from this blog or other conferences where I’ve been a presenter and were nice enough to make a point to come over and say hello. I met Deisie from Chicago, who sat with me through two sessions and then came to my panel presentation the next day. I wouldn’t be surprised if she ends up presenting at CHADD in a few years herself. I answered a question in Chris Dendy’s session and she said she liked my idea and might use it in her future presentations. How cool is that to have someone you admire (and her books are on my shelf) like your idea enough to use it? Woo-hoo! I left the conference motivated to keep advocating for our children with differences and with a few new ideas to work on to add to my skill set when working with these kids. I heard stories that helped me keep things in perspective. Things with my children could be worse. Things with my children could be better. I’ll keep working to support and encourage them as we teach each other through life. 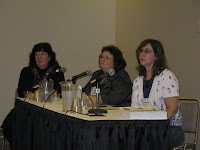 Stay tuned for those author interviews as a future blog posting.